The XVth NuFact Workshop is organized by Institute of High Energy Physics (IHEP), Beijing, China. It will be held in the campus of IHEP during August 19-24, 2013. 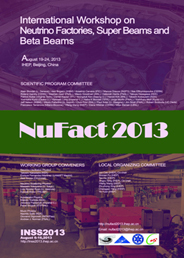 The NuFact workshops are one of the important yearly neutrino conferences with emphasis on future projects. The main goal is to review the progress, and share the challenges, on the different studies of future neutrino oscillation facilities able to discover and study the mass hierarchy of neutrinos, CP violation in the leptonic sector and possible new phenomena. The workshops are original in that they combine the skills of experimenters, theorists and accelerator physicists. 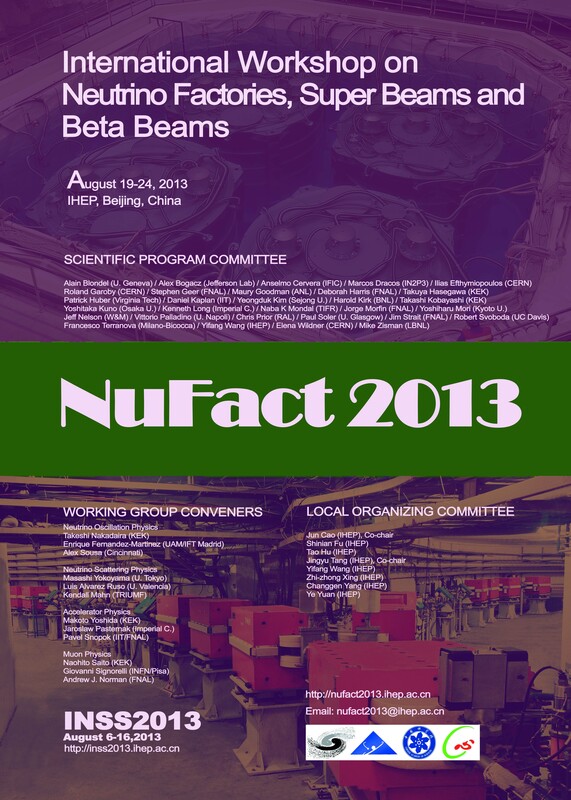 The registration should be made no later than Aug. 5, 2013, via http://nufact2013.ihep.ac.cn/reg.html. A user account in the IHEP indico system needs to be registered first, if you haven't, before the workshop registration. The registration fee can be paid via bank transfer (in US$) or by cash (in RMB only) at the registration desk upon arrival. The early registration fee is 380 US$. After Jul.18, 2013, the registration fee is 420 US$. Details of the bank transfer can be found on the registration webpage. The onsite registration fee is 2600 RMB. Only Chinese currency RMB is acceptable for onsite payment. The registration desk will start operation on Aug. 18, 2013. The registration fee covers meeting materials, six lunches, reception, banquet, coffee breaks, bus transfer from and to the hotel (Holiday Inn), and proceeding cost. No excursion is organized but a time slot will be reserved. For accompanying persons who would join the reception and/or banquet, payment needs be made at the registration desk. For contributed talks in the parallel sessions or Posters, abstracts should be submitted for selection by the working group convenors. Please submit the abstracts on the web http://indico.ihep.ac.cn/conferenceDisplay.py?confId=2996. A user account in the IHEP indico system needs to be registered first, if you haven't, before the abstract submission. The workshop registration is not required before the abstract being accepted. The deadline for the abstract submission is Jun.18, 2013. Early submission is strongly encouraged. A limited financial support, e.g. waiving the registration fee, will be made available upon selection for PhD Students and young scientists. Please send your request together with an abstract of contribution, financial motivation for request and a reference letters to nufact2013@mail.ihep.ac.cn. The deadline is Jun.18, 2013. The number of persons we will be able to support depends on financial support we will get. Early applications are strongly encouraged. We have reserved rooms in Holiday Inn (4 star hotel) and IHEP Guest House (2 star hotel). Chang-Feng Holiday Inn is 25-minute walk distance from IHEP. Conference secretary will book the room according to your registration form and send you the confirmation. The payment should be made to the hotel directly upon arrival. If you choose to arrange accommodation by your own on the registration form, you can also send email to reservations6420@l63.com, saying you are participant of NuFact2013, to get the conference discount for Holiday Inn. Sometimes there are special offers for the hotel. The conference discount cannot be guaranteed as the lowest price. Shuttle bus will be arranged between IHEP and Holiday Inn in the morning and evening during the workshop. Papers from invited and contributed talks and posters will be published in the proceedings electronically. Talks and posters will be posted on the workshop website promptly. 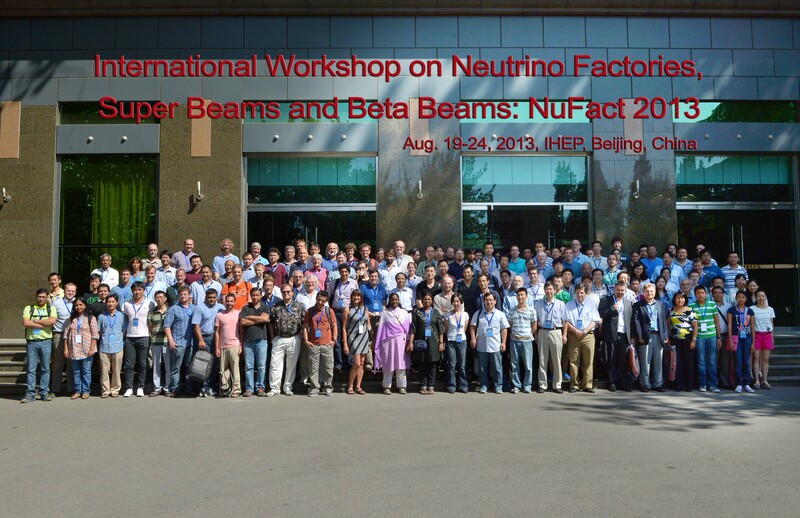 The International Summer School on Neutrino Physics (INSS2013), hosted by IHEP, will take place at Beijing Shunxin Green Resort, Beijing, China from August 6 to 16, 2013, right before the NuFact workshop. Young scientists and students are encouraged to participate in. 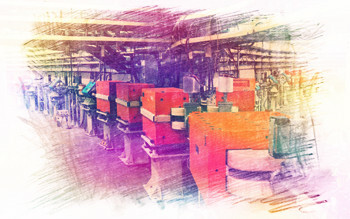 Please check the website http://inss2013.ihep.ac.cn/. All registration fee must be in Chinese RMB only. Please note that the credit card payment cannot be accepted. How to get to Main Building, IHEP by taxi from Airport: Download the pdf file show to the taxi driver. How to get to Guest House, IHEP by taxi from Airport:Download the pdf file show to the taxi driver. How to get to Holiday inn from Airport: Download the pdf file show to the taxi driver. If you don't want to walk to IHEP from hotel. Please get on bus at 8:00 am at the front of Holiday Inn hotel. Shuttle bus will be arranged to take the participants to get the meeting site from August 19-24. 5:45 pm, get on bus in front of Main Building to get to Banquet Site.